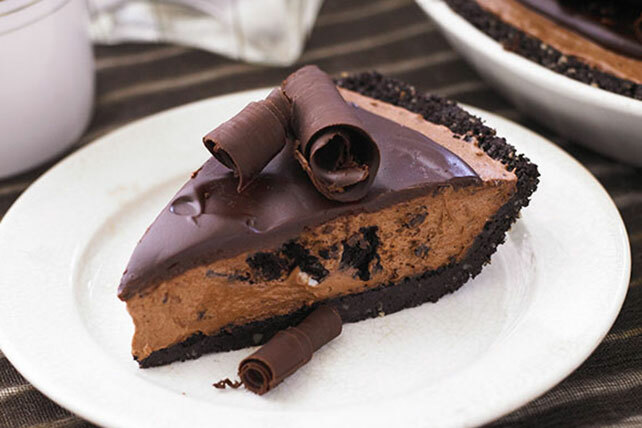 Crushed chocolate sandwich cookies, strong coffee and half-and-half give this easy-to-make but glorious mocha pie its chocolate coffee deliciousness. Spoon half the Cool Whip into small bowl. Refrigerate until thawed. Meanwhile, return remaining Cool Whip to freezer. Crush 20 cookies; mix with nuts and margarine. Press onto bottom and up side of 9-inch pie plate. Bake 10 min. ; cool. Meanwhile, chop remaining cookies. Reserve 1 Tbsp. coffee for later use. Mix remaining coffee with half-and-half in large bowl. Add dry pudding mix; beat with whisk 2 min. Stir in thawed Cool Whip and chopped cookies. Spread onto bottom of crust. Microwave 3 oz. chocolate and frozen Cool Whip in microwaveable bowl on HIGH 2 min. or until chocolate is completely melted and mixture is well blended, stirring after each minute. Stir in reserved coffee. Let stand 15 min. ; spread over pie. Garnish pie with chocolate curls before serving.